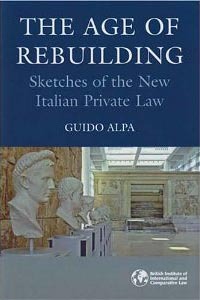 Italian private law is undergoing a complex and fascinating process of evolution. Its Roman and French roots and the legacy of the codification age are now merged with EC Law, and with other sources of law, like case law, and even with the results of commercial practice. This book is divided into five parts. The first is devoted to the resolution of some of the most important and difficult problems in private law: the definition of personal injury and the application of various methods of calculation of damages; the hypotheses of strict liability in tort; environmental damage; freedom of contract; and the results of the application of the EC Directive on unfair clauses in consumer contracts. The second looks at commercial law, considering consumers' interests; financial services (and the Parmalat case); competition and fair trade; mergers; and the transparency of banking contracts. The legal profession, as now regulated in Italy, is the subject developed in Part III. The book ends (Parts IV and V) with reviews of some relevant contributions of English jurists to the discussion of the present needs of legal systems in Europe and with an essay on the new aspects (and meanings) of legal certainty. Legal systems in Europe are now converging, and the acquis communautaire is helping this process. Legal cultures are merging too; legislators and judges can profit from foreign experiences when they try to achieve a satisfactory balancing of conflicting interests. the needs of a general codification are now challenged; it is necessary to 'rebuild' the old machine of the law, taking into account the living sources emerging within society. In Italy as well as in Europe at large, soft law is now replacing hard law.